School is important and responsible stage in the life of every person. It is particularly important to study well and not to pretend that you visit the school. Baby Elsa well enough in school, but she and the other children want to relax and take a break for five minutes, but the teacher was fond of training and do not allow the children to rest. So our heroine is trying to play on the lesson until the teacher sees that the girl is occupied not by mathematics. Help a lovely student to have fun. You are waiting for four games. You will collect a picture, choose a mouse face with a smile, to defend the castle from the arrows and rearrange pieces into place. Use the mouse and not get caught the eye of master Olaf. Otherwise he will punish famous student, and you will lose the game. Just you have five minutes. Stay within the allotted time and earn maximum points! Played: 33723. Added: 3-06-2016, 14:44. 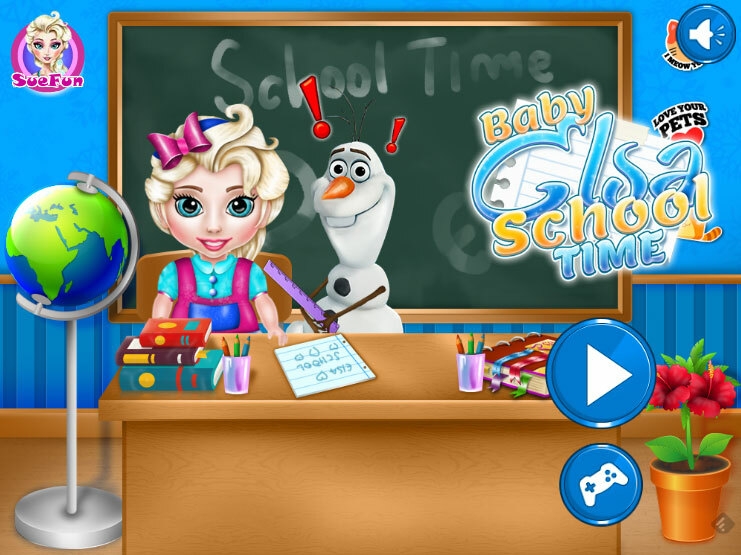 Baby Elsa School time game. Baby Elsa and Olaf at school.